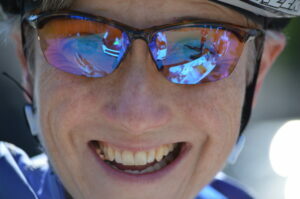 Deborah first rode the TNHBR in 2013 and has ridden every year since. How long have you cycled and what got you into it? 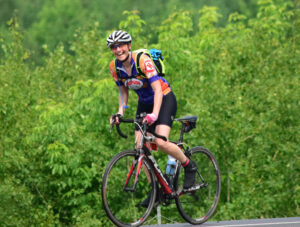 I have been a mountain biker for 20 years but only got into road cycling about 6 years ago when I did my first Trans NH ride. The first year I rode I used a cross bike because I was so intimidated by the narrow tires of road bikes. I started road biking specifically because if the Trans NH ride in honor of my nephew Spencer who has Duchenne’s Muscular Dystrophy. I am an occupational therapist in a rehab hospital in Richmond Virginia and I specialize in adult rehabilitation for people affected by neurological deficits, such as stroke, brain injury, multiple sclerosis, and Lou Gehrig’s Disease. I also started a company where I travel with any individual with a disability who wants to travel but needs assistance. I provide 24 hour care throughout the trip to make sure the individual is able to maximize their experiences on the trip. 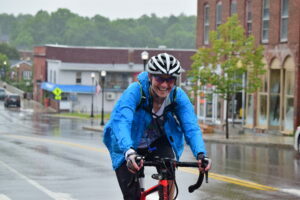 What brought you to the Trans NH Ride? I ride in honor of my nephew Spencer. Living out of state I find it difficult to be able to show my family that I am here for them. This ride allows me to show that I am willing to sacrifice time and energy to do what I can to support them. I really enjoy the camaraderie of the ride and the opportunity to visit with my family. Riding in New Hampshire in late June is beautiful! What is something others on the ride might not know about you? They probably know everything—I tend to talk a lot!! What are 3 things you would like your profile to say? It is important to show your family and friends you love them on a regular basis. I love taking time to look at the beautiful scenery on the ride including the lupine in northern NH, the chance of seeing a moose, and the beautiful mountains and lakes. I enjoy a challenge and the opportunity to surprise myself!